Voters in Pakistan may not have their ballots by election day, July 25, because over 100 candidates have pending legal cases that keep them off the ballot, preventing election officials from printing the ballots in time. The Pakistani newspaper Dawn notes that at least 108 cases exist of candidates with pending cases in high courts, many appealing a rejection by the election commission to put their name on the ballot for illegal activity. 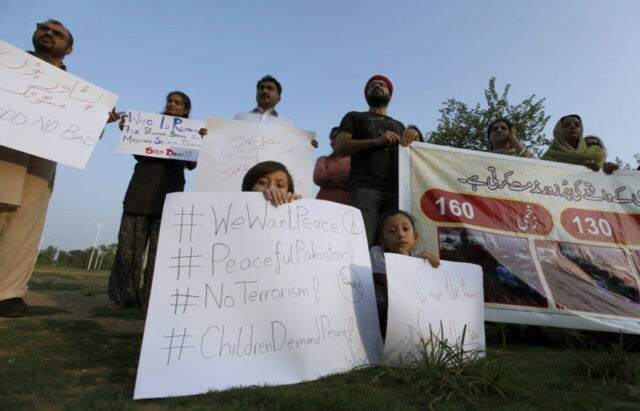 Pakistan’s national legislative elections this month have been marred by extreme violence, terrorism, and the widespread presence of jihadist candidates. As of this month, a variety of Pakistani jihadist parties have nominated nearly 400 Islamist candidates for regional public office. According to an unnamed election commission official speaking to Dawn, 108 candidates are facing legal action to take them off the ballot. The unresolved cases mean that the commission cannot begin to print the ballots with candidate names on them, as they do not know if appeals to get in the election will place or remove names from the ballots by next week. “The [Election Commission of Pakistan] ECP finds itself in a quandary and is set to miss the target of completing printing of ballot papers as per its plan and transport the same to the districts concerned and down to the polling stations by July 24,” Dawn notes. The cases the newspaper mentions are predominantly instances of candidates providing inaccurate information to the ECP. One candidate in Sindh, Nisar Ahmad Khoro, lost his position on the ballot for “allegedly declaring two wives instead of three as his dependents and concealing assets,” Dawn notes. His case awaits appeal, which means he could win a place on the ballot after the time in which the ECP is supposed to have started printing ballots. Failing to declare offshore assets was another popular reason for being expelled from the election. Another concern Dawn highlights is the fact that an untold significant number of cases do not have a scheduled date in which local courts will bring them up. If not scheduled before July 25, the ECP will be prevented from printing ballots as it will not have a final list of candidates. Regional elections that may not have ballots ready in time would join at least four elections for regional legislative seats that the ECP announced have already been postponed to an unspecified date due to the deaths of two candidates, Awami National Party (ANP) leader Haroon Bilour and PB-35 (Mastung) candidate Siraj Raisani, according to the nation’s Express Tribune. The regions in question, throughout the country, postponed the elections out of security concerns for the candidates involved. The national elections have attracted the attention of several significant Islamist political parties, many affiliated with the anti-blasphemy Tehreek Labbaik Pakistan (TLP) group. Pakistan is home to one of the world’s few remaining laws against blasphemy, which proscribes death for anyone who speaks ill of Muhammad. “Crimes” like speaking ill of Islam generally or desecrating a Quran can also trigger severe legal repercussions. While the laws technically apply to protect all religions, there are few cases in which defendants are not accused of slandering Islam, often under false pretenses. Most targets of blasphemy accusations are Christians, many of whom are killed by angry mobs long before their legal case begins. 395 candidates in next week’s election are members of Islamist groups, and protecting the blasphemy law has become a major issue on the campaign trail. The widespread presence of Islamists in this election has also generated a climate of violence. Death threats from radical Muslims regularly target campaign rallies. In the deadliest execution of a death threat yet, the Islamic State staged a suicide bombing this weekend at a campaign rally that killed at least 128 people and injured hundreds of others.